"Classic Kara" and "Modern Kara" fight. Classic Kara goes on and on about how Supergirl shouldn't be whiny and acting like a pariah, but happy and inspirational. She's not frightened or selfish, she's good and hopeful. Classic Kara seemingly convinces Modern Kara she's not worthy of the "S", and Modern Kara seems to liquefy and get absorbed into Classic Kara... and then shortly thereafter breaks out of Classic Kara as if she were made of glass, saying that "the real Supergirl" doesn't ever give up. Classic Kara is revealed as the Pointy-Shouldered Woman from issues past, who goes by Dark Angel and works for The Monitor. She was testing "anomalies" who were "supposed to have died in the crisis" to see if they might lead to time unraveling. The Monitor is convinced Kara is the real deal and says Dark Angel went too far. The red sun was part of Dark Angel's testing, as were the assassins sent to kill Kara and apparently the "manufactured" reason for Kara to kill her cousin... but "the tragic story of her journey to earth is fact". What? Those contradict each other? NEVER YOU MIND, The Monitor has spoken. As The Monitor leaves with Dark Angel, she tosses a... green candle into space. It sits there burning as Kara decides what to do next. As Kara settles on a bath, a hand reaches for the green flame, but instead grabs Kara's cape and turns her around, the mystery person saying they came a long way for Kara... "from hell and back", and Kara seems quite surprised to see whoever she's looking at. Story - 1: So, if we're to go by this issue... Joe Kelly thinks we who wish Kara was more than has been presented to us lately are whiners who just want Kara to be perfect all the time, an agent of The Monitor (who has one of the most ludicrous outfits I've ever seen and looks right out of a 1992 comic by Image) decides to test if Kara belongs in the universe by... hiring assassins to kill her and turning the sun red for no apparent reason, and Kara still has wacky crystal powers and still killed a room full of children and the phantoms are still all over earth. To sum up: Nothing Happened. First of all, what is it exactly Dark Angel can do? When she looks like Classic Kara she not only flies and has super-strength, but has super-breath and heat vision. After she punches Kara through the ground, Kara gets hit by a train and we can clearly see people inside the train. Kara then wants to go help the people who may be hurt, and Dark Angel tells her that the train was empty. Or were we seeing some illusion Dark Angel made Kara see? The problem, like so very much of Kelly's run here, is that it's vague and completely unclear. Were there people dying? If so, Kara completely forgot about them and left them to die. If not, and we were seeing an illusion, why wouldn't that be made clear? I was actually right on with this book until page 9. I thought it was the amazing turnaround I, and so many others of you if the emails you send me are any indication, had been hoping for. And then Dark Angel says Kara should do the right thing "all of the time." That she shouldn't have problems, because who wants a Supergirl with problems they can relate to? And then Dark Angel says Kara should be perfect, the final straw. This is all couched in Dark Angel trying to "confront Kara with her self-doubt and self-hate". Manufactured story reason notwithstanding, this feels like Kelly telling those of us who want better for Kara to go take a flying leap because we just want a "perfect" character that, apparently, no one can relate to. This fails on so many levels I don't even know how to address them. I don't ever recall seeing a single person saying they wanted Kara to be perfect, or that she shouldn't have problems. Even Superman isn't perfect, and I wouldn't want him to be. Their humanity, their problems and failures and striving to do better are what make them relatable, amazing characters. But their problems and failures, actions and feelings need to be justified. They need to make sense. They need to have a purpose. 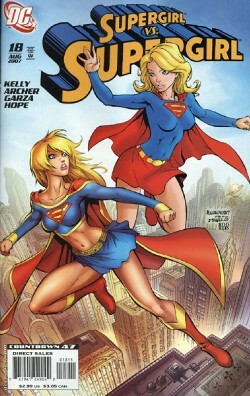 "Supergirl", as a book, has largely failed on all fronts since its inception, especially so under the Kelly run. Look at this very issue as a prime example. Kara says she "fought against everything inside her to deserve the trust" Superman put in her. Except that she didn't. At all. Ever. All she did was tell him to go away... until last issue, when he's in the suit trying to stave off the phantoms, and she tells him he's the greatest man she's ever known... FOR NO REASON. If you're going to establish Kara as not wanting to talk to or be around or have anything to do with Kal while she tries to figure herself out, I am down with that. It's a good concept for, hopefully, a good story. At the end, yes, she should come to realize that he IS the greatest man she's ever known and that she should try to be deserving of his trust... for a logical reason. She should see his selflessness, his courage, his strength of spirit, his hope, and it should inspire her to want to emulate him. Doesn't that sound like an amazing story? Yes, I do believe it does. And that's what we should have had. Instead we get ten issues of her whining and complaining and then she suddenly loves and respects Kal with no character motivation whatsoever. Why would this Kara now suddenly feel that way about him? Yes, it's what we all want, but there's NO REASON for it. The story was supposed to move her there. It didn't. It shifted her around, let her chase boys, had her whine and complain and suddenly arrive at the destination without ever taking the journey. It's A to C with no B, and B is what makes the whole thing work. B is the heart, and that's what Supergirl, both the book and the character at this point, lack. Look at the other glaring inconsistencies in this issue. Dark Angel can turn the sun red. Or make Kara think the sun has turned red. Either or, which is a problem on its own, but regardless of that... if she can do either of those things, why does she need to hire assassins to try to kill Kara? And how would that prove Kara belonged in the universe? Fight off some mercenary killers and this means you're not an anomaly from a different world or universe? Oh of course, silly me. I guess I must have slept through that lecture in my "How to prove what universe someone came from" class in college. What was the point of turning the sun red? Or making Kara think the Father Box turned the sun red? It served absolutely zero purpose, because Kara still had powers anyway. Never mind the missing month of time from last issue. Never mind Argo City and the entirety of the Kandor arc. But forget about that stuff, man! Kara has problems! For no reason! And resolves them! Without explanation! Isn't that so much better? More inconsistencies abound... The Monitor tells Kara that Dark Angel "manufactured the opportunity" for Kara to kill her cousin. What does that mean? Made it all up? Put the thought in her head? Who knows! And before you can try to figure it out, The Monitor says "the tragic story of Kara's journey to earth is fact". But Kara's purpose in coming to earth was to KILL KAL! So... the phantoms and the crystals are all real, and Kara's origin and reason for coming to earth are real... but the "opportunity to kill Kal was manufactured". What do you mean that doesn't make sense? It's perfectly clear. Crystal, in fact. If Kelly can't even get his own story straight, how can we? Was she sent to kill Kal? Or was it all Dark Angel's manipulations? Why, it's both! And if you don't see that you just want Kara to be a perfect being without a single fault who does the right thing every single second of her life and you can't relate to her! I mean, it's all right there on the page. Can't you see? So rampant were the inconsistencies and character leaps-without-logic I honestly cannot believe this was written by the same person who wrote Action Comics #775. It's not even possible. I now equate Kelly's run on "Supergirl" to Chuck Austen's run on "Action Comics". And boy howdy, does that ever make me sad. The only explanation I have is that Joe Kelly isn't actually Joe Kelly, but is really Dark Angel trying to make sure that all of us still reading aren't anomalies from another universe. Although, if you're still reading this title, you might be. Art - 3: I started out enjoying the art very much, but then you get to things like page 7 where everyone looks like their heads are footballs with faces painted on and it kind of pulls you out of the lack-of-story. The football heads reappear on page 12, and in that middle panel "Classic Kara" has a torso that's about two times too long. The splash on page 16 is pretty nice. Kara's skirt is finally a little longer than a glorified belt, but they seem to have moved it down to what I'd call "dangerously low". Peculiar. Other pages, like 19, I found to be quite dynamic, exciting and well-executed. I'm guessing Garza & Archer just split pages on this issue, and basing on what I've seen of Garza last issue, I'm betting his are the pages that bring this issue up from where it otherwise would have been due to Archer and his "football heads." Oh, and I realize Dark Angel's costume has been around for a long time now, but come on. If you can redo the costumes of major characters like Kara, you can redo the costume of Dark Angel. Good lord, that may be the single most ridiculous costume I've ever seen in a comic, which is saying something. Cover Art - 3: Only on issue 18 and already doing a self-referential cover that ALREADY had two versions previously? Bad form, I say. For that you get a 1, but Garza's excellent art once again brings the score up.